As the Sooo Pinoy Food Trip Cebu Leg group contninue, going around the Queen City of the South to sample the culinary delights of Cebu with Uniliver Food Solutions. From the Eastern resort stretch of Mactan Island - Shangri-la Resort and Spa to the southside shores of the Island, our next food destination for Soo Pinoy Cebu is the serene Plantation Bay Resort's Fiji Restaurant. 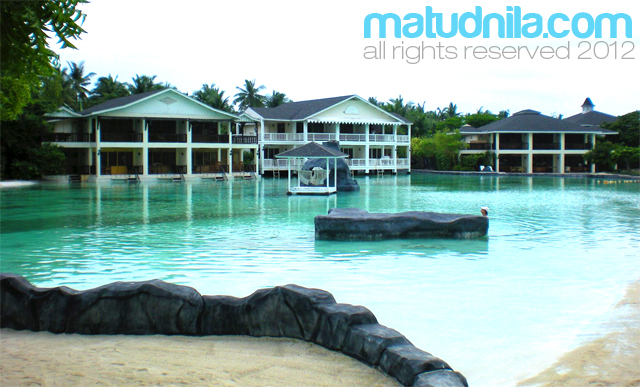 Plantaion Bay Resort Mactan is ideal for Family, Relaxation, Romance, name it with almost 12 hectares resort property of 5-star Colonial Plantation charm. Plantation Bay Resort Mactan's Fiji Restaurant Executive Sous Chef, Henry Abellana uses the locally available source of Ingredients in his Seafood showcase for Sooo Pinoy. 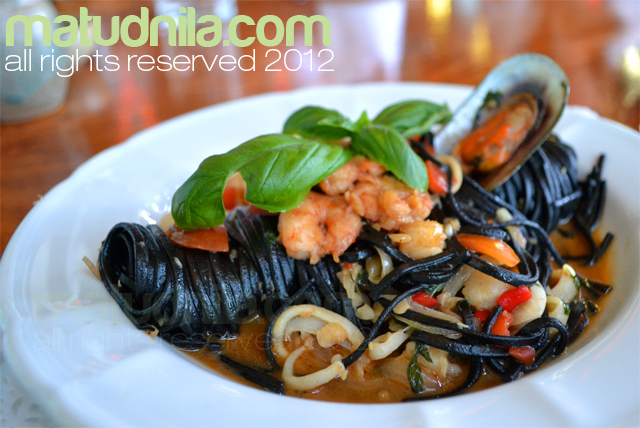 Chef Abellana's Sphagetti Al Nero (Black Sphagetti) lets you enjoy your craving for flavour of squid ink minus the black color on your teeth. How did he do it? Plantation Bay Resort's Sphagetti Al Nero freshly homemade Pasta is comprised with black squid ink and not in the sauce. Sauteed with white wine, onions, tomato, olive oil, scallops, mussels, squid, peperoncino and Uniliver Food Solutions. Now you can do your usual conversation while enjoying your Black Spaghetti. The cleverly named dish of Fiji Restaurant is also showcase to Sooo Pinoy. Twinned of crustaceans, Prawns and Lobster coined "Kissing Cousins". After the name, now you're interested of tasting it right? 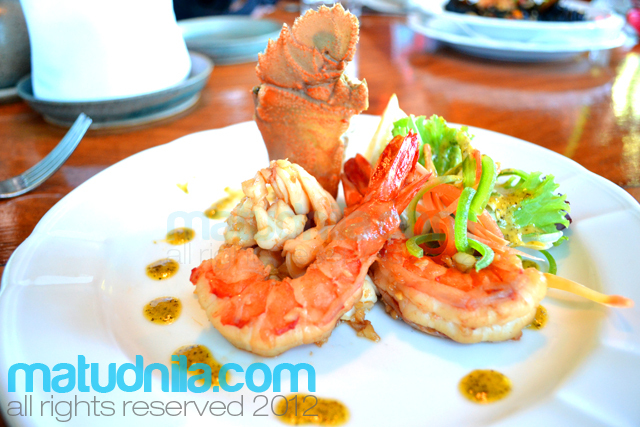 Fiji Restaurant's prime appetizer Kissing cousins menu which stands out from the rest. The cousins is sauteed in garlic and white wine. Fiji Restaurant at Plantation Bay Resort Mactan is one of four restaurants which specializes on Seafood offering. Nested on the sea shores of the resort with both Al-Fresco and Air-condition spaces. 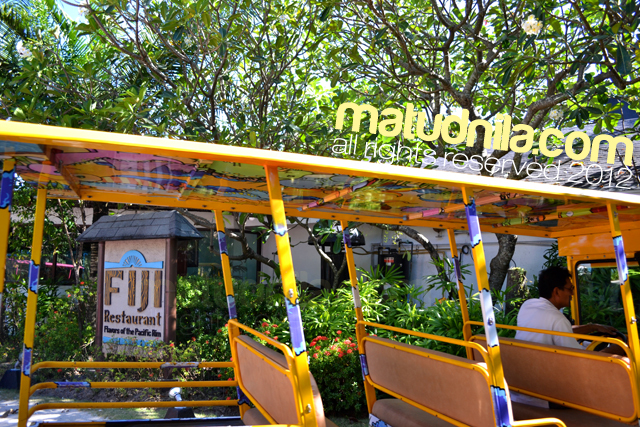 On wednesdays Fiji Featuers Filipino Fiesta which will feature different filipino dishes ranges from Lechon to Humba (Adobo) and more. After the interview with Plantation Bay Chefs, we jump start to our way from Mactan Island to Uptown Cebu at Chika-an sa Cebu for their famous Utan Bisaya. To fill your Filipino cuisine craving, know more about the Sooo Pinoy campaign by liking the Sooo Pinoy page on Facebook or follow @SoooPinoy on Twitter. Sooo Pinoy Food Trip Cebu - Plantation Bay Resort Fiji Restaurant posted at Cebu Events Blog. 0 comments: on "Sooo Pinoy Food Trip Cebu: Plantation Bay Resort Mactan Fiji Restaurant"